Levi chose gymnastics as his spring sport this year. He really loves it and is so excited to go each week! Levi is now 6 years old! We celebrated his birthday on Sunday with the Oma's & Opa's, Grandma & Grandpa, Uncle Jordan, Auntie Kristy & Alex. 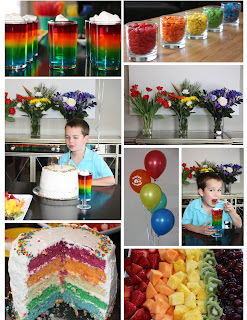 Levi requested a rainbow party, so we tried to make it very rainbow! 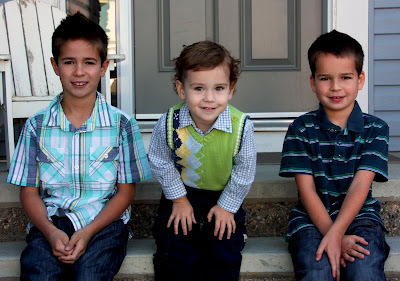 Happy Birthday to the cutest, sweetest, six year old we know!!! We love you Levi! Happy Birthday to our 6 year old today! We love you and are so proud of you Levi! Levi and I made homemade gummy snacks the other day. Levi was a great little helper and was excited to try them out. We mixed one package of jello with 3 packages of gelatin and 2/3 cup hot water, mixed it really, really good and then poured it into candy/chocolate moulds. It only took about 30mins to set and then we popped them out of the mould and they were ready to eat. Levi took each one out and arranged them on a plate. I wouldn't exactly call them healthy, but the boys all really liked them and since they were so easy to make, we would make them again.